Open floorplans continue dominating the interior design world. Whether it is the floorplans visual appeal or entertainment value, homeowners are constantly captivated by its ability to transform their home’s look and feel. 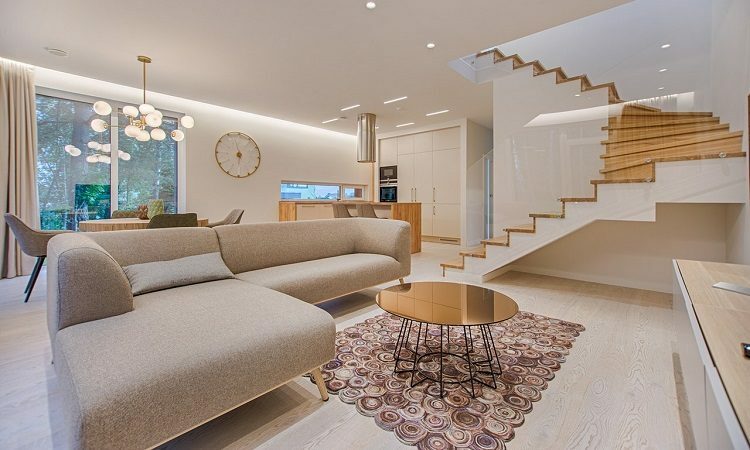 Luckily, adding furniture into your open floorplan can make this modern design your own. The right furniture selection is how you pull everything together. A space isn’t yours until you hand-select furniture. From the start, make sure that you pay attention to every piece you purchase. Then, you can visualize how it will work in the space. This is the perfect kick-off to finding the right furniture for your home. If you are ready to make your open floorplan the design of your dreams, here are the top things to consider when picking out furniture. Each room of your home has a determined purpose. Knowing the use of the space and which furniture you need to accomplish that can save you time and money. Before furniture shopping, have a plan set in place. Then, you will have an easier time choosing the furniture that fits the space. It might sound like a no-brainer, but frequently homeowners buy furniture without knowing which room they will place it in. This reckless behavior can leave you with mismatched pieces that don’t fit your space and thousands of dollars to show for it. Save time and money by following your plan rather than wandering around aimlessly not knowing where to start. If you like an updated contemporary look, then find streamlined pieces that focus on straight lines. If you lean towards mid-century modern, look for vintage-inspired pieces that speak to that style. Whichever, looks you prefer don’t feel limited to that particular style. Your home’s design is about you. Make sure it stays true to that concept with pieces that fit your personal style. Besides picking your style preferences, you should also consider your lifestyle. If you have children and pets, you should pick furniture that’s easy to clean. Stay away from materials that are easily stained and expensive to replace. Make sure the furniture items you choose fit your current lifestyle and any future plans. For example, if you don’t currently have kids, you might opt for high-end leather sofas. However, if you plan on having children in the next ten years, you should consider more kid-friendly alternatives. No matter how well you think you know your home, it can be difficult to visualize how an item will work with your other furniture. Don’t rush to get the piece. First, take a picture of the object and a swatch of the fabric. That way you can take it back to your home making it easier to visualize it all together. If you are buying multiple pieces, try taking all of those pictures and placing them on a drawn-out home plan. This works well for homeowners that are in the process of building their home. Choosing fabrics and colors that tie together your furnishings can bring the entire design up a notch. However, it can seem tricky to hit the right notes. One strategic way you can match your furniture is by using a complementary color scheme. Complementary colors lie across each other on the color wheel and provide the most cohesive looks. You can also choose a monochromatic look for an added touch of elegance. If you want to throw in a few patterns, keep things harmonize by using designs that fit your chosen color scheme. You can also bring everything together with a perfectly-designed piece that includes the colors of various pieces. For example, a colorfully patterned rug can tie your light grey sofa and your off-white chair together. Once you have found all the right pieces the next step is placement. An interior designer’s secret to the perfect furniture placement is measuring the distance between furniture pieces. Leave enough room to move but not enough that it looks like pieces of your arrangement are floating without a purpose. As a good rule of note allow 30 inches between furniture. However, for the coffee table and sofa, give about 14 to 18 inches of room. This point might be easier said than done but pick furniture that fits your price range. You may go into a store wanting to spend less than $1,000 but fall in love with an item that is three times the price. When this happens, you could be tempted to spend the extra dough. However, doing this a couple of times can really drain your pocketbook. Try sticking to your budget every time you shop, and you will eventually find furniture that you love AND a price tag you do as well. Whether you have an open floorplan or a traditional one, the easiest way you can find furniture that perfectly fits is by working with an interior designer. Together you will hit all of the right elements for accentuating your floorplan.